Finally it has arrived the perfect Lunch Time laser. PicoSure Focus Lens Array – The Worlds most advanced laser at the Taylor Clinic. Minimal down time and maximum results. Tried fractionated laser but didn’t like looking red faced or sun burnt for days? Hated the tiger stripes and rough scaly feeling as your skin changed over the week? Well, like all technology, a newer one will come along and make the previous ones obsolete. Most photo-rejevuenating IPL lasers have increased side effects with darker skin types, and tanned skin because skin with more melanin has increased risks of hyperpigmentation and hypopigmentation. However, with PicoSure Focus Lens Array, the new histological evidence shows that the more melanin in your skin, the more “Laser Induced Optical Breakdowns” are formed. With more LIOBs in the dermis the more collagen and elastin deposition, meaning more youthful looking skin. The pressure wave technology of Picosure means no downtime. 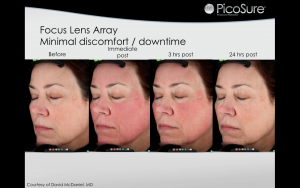 PicoFocus Lens Array is perfect for photo rejuvenation, acne scarring, pigmentation, fine lines and wrinkles and is available at the Taylor Clinic.